Cooking from scratch is the best way to ensure that what you’re eating is as healthy as it can be. I purchase pastured pork from a friend who raises hogs and I get all the pork simply ground, no spices added for sausage. The butcher shop we use will make nitrate free sausage, bacon and ham, but I prefer not to have them add the spices because I don’t know exactly what they use. Not to mention, when I mix it up myself each time I can make it however I want and tweak the flavors depending on what I’m making. I don’t have to figure out at processing time exactly how much of each type of sausage I want. If I want to make sausage and lentil soup I’ll mix hot Italian spices with the ground pork. 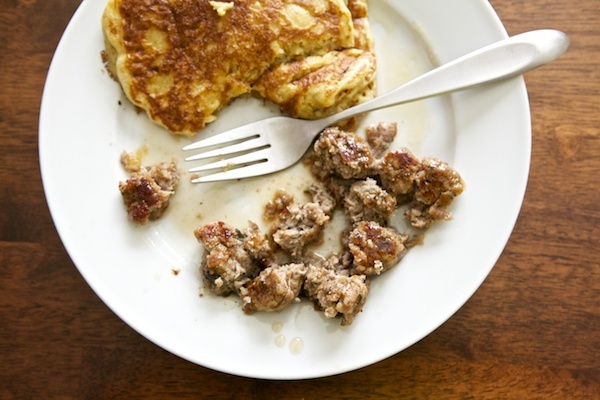 If we want to have sausage with pancakes, I mix is savory breakfast sausage spices. Over the years I’ve played around with different spices and come up with a recipe we really love. Mix all spices together then sprinkle over ground pork. Mix well to incorporate spices evenly into pork. Form into balls and put in container. Let sit overnight in fridge to allow the spices to infuse the pork. 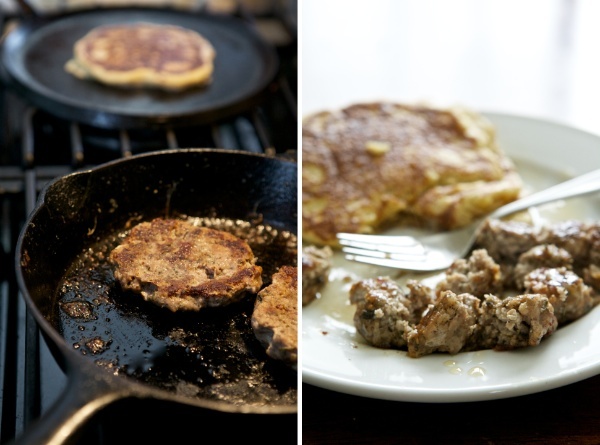 In the morning, smash balls into patties and fry up in a cast iron skillet. If you can’t eat them all in one meal, keep remaining uncooked sausage in fridge and cook the next morning or within a a few days. Optional Ingredients: 1 grated apple, other sweet spices: cardamom, cloves, ginger, maple syrup, etc. I usually add a grated apple to my sausage along with the spices, it adds a delicate sweetness to the sausage (any cooking apple will do). You can also add maple syrup to the sausage when you mix it up, but it has a tendency to burn in the skillet so I prefer the add it after cooking. I much prefer my syrup on my sausage than on my pancakes. Lately I’ve been playing around with making more of a sweet spice sausage than a savory sausage and it’s quite good. When I get the recipe just right I’ll publish it here. What’s your favorite kind of sausage? Italian, breakfast, maple, other? A great source for organic herbs and spices is Mt Rose Herbs. I find they’re products to be of great quality and purchase any herbs/spices I don’t grow myself from them. Yumm! Looks wonderful, and what a great idea to not have the butcher add spices & make it all up ahead of time. I love sausage.. its probably my favorite meat.. Italian spicy is probably my favorite.. I would love to see your Italian sausage recipe 🙂 it is the sausage that I enjoy the best. I’ll have to figure that one up too one of these days. I have never even thought of making sausage before, but I will now. Like you, I only have two to cook for. Have you ever tried freezing these uncooked. I look forward to making this. Yes, you could easily freeze the leftover sausage in individual patties with parchment paper in between. Usually a pound of sausage will last us as long as our batch of pancakes. So we eat them for three consecutive mornings. Great idea – I’ve added sausage making to my culinary challenge list. It isn’t something I would have thought of doing for fear of needing sausage making kit but makes sense to have patties instead. Obvious really but….! We really like hot italian sausage and maple. I love making stuffed mushrooms with italian. This sounds so good! We made venison sausage last year for the first time when my hubby had a particularly sucessful hunting season. It was good but I don’t think seasoned well enough so we used it for burgers-the maple breakfast version made for great bbq bacon burgers. I would love to try doing this as soon as I get some pastured pork-next item on my list! I never thought of mixing it up each time! I love adding apple to my breakfast sausage! Maple syrup on it is soooo good too! When I got my pork I got it ground plain too so I could add what ever spices I wanted. Susy, where do you get your pork from? My hubby is on me to locate this!! Although, I think he is a bit disappointed in the amount of bacon you get from one! I got mine from a friend, you can also get just bacon at Local Roots if you want. I bought half a pig and got a HUGE side of bacon (whole belly picked up at the butcher, which I cured myself). I can send you her info if you’re interested.